It’s Halloween, the time of the year when those miniature candy bars beckon and pretend to be low calorie. They are if you compare them to the full size version and eat ONLY one. Yeah, like I can really eat only one of anything I like. So I’ll exercise for 30 minutes and then eat candy. My children seem to have inherited my sweet tooth. One son liked the spooky decorations and now has a secret candy drawer. The other was not big on all the Halloween costumes and stuff, but never passed up a bag of candy corn. I have finally (after all these years) captured a glimpse of his love of Halloween candy corn. This year I made spicy caramel popcorn using Martha Stewart’s recipe. It was a big hit so I put the recipe behind the photo on the scrapbook page. Also on the Making Memories paper are Dress It Up Halloween buttons with the shanks cut off, an accordion booklet sticker, a Making Memories epoxy button, and a painted Deja Views cardstock letter. I have another idea for a Halloween pirate page and I’ll try to finish it before I pack away the Halloween craft stuff. 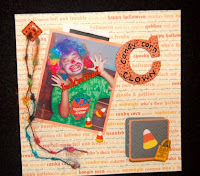 Try to make at least one Halloween scrapbook page before moving on to Thanksgiving layouts. It’s a fun time of the year to remember with photos and journaling. Sorry I haven’t written up the wreath project yet. This week I’ve been experimenting with turning an old partially used blank marble tablet into a new idea journal. I often get my best ideas (especially the jewelry ones) from T.V. shows or magazines. I like to sketch what I see before I forget it, so I thought it might be helpful to have a blank tablet and pencil nearby my favorite comfy seat. Hopefully, now I won’t lose the little scraps of papers with ideas and sketches. I’ve covered the tablet with thick Japanese mulberry paper that I’ve hoarded for so long it became discolored and bug eaten, but I like to call it distressed. Gel medium has just become my new art supply friend because I discovered that it is like a colorless acrylic paint, which can serve as both a protective coating and glue. There are several brands of gel medium on the market and they are sold at Ben Franklin Crafts near the artist paints. I was going to hold off showing you this journal project until later because it doesn’t really fit the fall theme, but then I saw the most incredibly beautiful Asian rubber stamps. I don’t know if all our stores are carrying them or who the manufacturer is, but I found them at the Hilo Ben Franklin Crafts. The large stamps with flat, acrylic handles are very artistic and would make excellent gifts, which is why I thought I should show you the stamps now before they sell out. If you need lots of office, teacher, etc. gifts these large Asian stamps could be used to make card sets. I’ll show you a technique later to minimize the work needed to colorize the images. 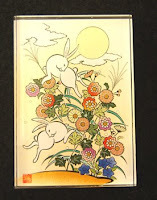 Ben Franklin Crafts also has some foam rubber stamp sets in Asian themes with a wood block look. 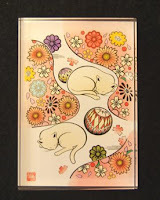 These could be used for gifts with blank greeting cards and Versa Magic dewdrop inkpad sets. As soon as my new recycled journal is dry, I’ll show it to you…. Ah, the last newsletter of the year is done, well at least the initial draft. The copy still has to be set up and proofed, but the hard part is done. Hooray! Even though it is the double issue, there was too much information so maybe one of the projects will have to be pushed to the next issue. If you entered the tag contest, be sure to check the newsletter to see if you won. Halloween is only 11 days away and I am still buying supplies. There are so many cute Halloween items at Ben Franklin Crafts that I know I will want to put onto my album pages. Even after Halloween passes, I will still be working on preserving my memories of past Halloweens. With that thought in mind, I purchased Dress It Up Halloween buttons and Making Memories glittered chipboard tags/ embellishments. Also from Making Memories, I found a 12x12 Scrapbook kit that had lots of the cute papers, word stickers, letter stickers, and Halloween buttons. Since I was going to buy all the components anyway, I decided it was more economical to purchase the kit. Another charming Halloween item that I could not resist was the Paper Company Studio accordion booklet stickers. I bought similar Valentine ones and used them successfully in layouts and on cards so I knew the Halloween booklets would be equally useful for journaling in small spaces. The final Halloween item I purchased was the Martha Stewart insects rubber stamp set. I don’t intend to use the stamps for Halloween, but I think their bold graphic style will be useful for future projects, perhaps the giant ant for a picnic invitation or the retro-looking fly for a rebus-type card. Besides the newsletter, I finished two new projects, which made me very happy. Pictured here is a necklace made from what the Bead Shoppe labeled, ‘new jade’. I don’t think this earth-toned gemstone is jade; perhaps it is serpentine, a stone softer than jade. Regardless of what is the real identity of ‘new jade’, I think it is a beautiful gemstone. The findings for this necklace are from a trunk show, so I won’t be publishing the instructions, but I hope that you may be inspired by the design. The other project, a 15-minute wreath, will be explained on this site. 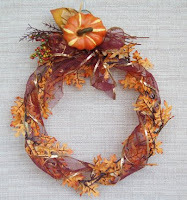 If you need a quick decoration or something to take to a Thanksgiving dinner; try this super easy project. This blog is getting too long, so I’ll write more next time about the holiday items I recently bought. Last night I did my weekly Ben Franklin Crafts shopping and as usual I found a bountiful array of craft delights. I thought I had purchased enough Martha Stewart Halloween stuff, but I still bought more because I’ve been watching the Martha Stewart Show (9:00 am on the FOX channel in Hawaii) and I’ve learned more about the products on the show. I decided that I had to have the gothic font clear rubber stamps because I wanted to print some spooky words and I think the font will be useful for other projects as well. The spider punch seemed a bit delicate and I worried that paper would get stuck in it, but I used it on leftover black cardstock and it work very well. I think the punched out spiders will be fun to add to this year’s goodie bags instead of plastic spiders, which may pose a choking hazard. I didn’t notice the flocked insect stickers or the black and white Halloween ribbon tape on my last shopping trip, so I bought both and plan to add them to my mini-album pages to hold down the photos. I liked the double stick Halloween stickers so much because they look great with glitter or flock that I decided to buy the package of double stick insect stickers too. I think they are just what I need to quickly embellish my goodie bag labels. Oh, I saw Martha using the mini skeleton and spider tags on TV and because they were inexpensive, I bought a package to use in my mini matchbook album to add extra journaling space and cuteness. I bought lots more wonderful items and I’ll write about them either here or in the upcoming newsletter. Don’t forget the entries for the tag contest are due Nov.1st ! I finally wrote up the last two Halloween projects and I hope you’ll have fun making them. Last week I purchased a Spin-n-Bead gadget (Beadalon) and today I had the time to play with it. It took me awhile to get the hang of it, but using the Spin-n-Bead is definitely a fast way to string seed beads. For someone who likes to craft while watching TV, the ability to be able to read the subtitles of the Korean soaps and make multi-strand seed bead necklaces is truly amazing multi-tasking. Most seed and bugle beads have holes large enough to accommodate the fine needle, which comes with the Spin-n-Bead. I found that spinning the wooden bowl fairly fast and just skimming the surface of the beads with the needle worked best for me, even though the instructions said you didn’t have to spin fast. Also, I had to adjust the curve of the needle in the beginning because I could hardly pick up any beads. Playing with the spinner is probably the best way to figure out a method of stringing which will work for you. Stringing the beads with this tool is hypnotic and now I’m trying to think up jewelry designs to incorporate strands of seed beads. I like putting a mix of beads in the bowl because this process of stringing allows for a truly random pattern. Being a seed bead addict, I can’t wait to try more color combinations to see what kinds of strands the Spin-n-Bead creates. I’m so happy that I’m spinning out of control! I discovered a way to triple my crafting area without doing a house renovation…..I cleaned and reorganized. I know I’ve written about this before, but it’s so wonderful to have more room, that I can’t stop thinking about it. Why did I take soo-oo-ooo long to rearrange the table, add more rolling Iris bins, and generally put things where they belong? Next I need to get new curtains so my craft items won’t fade from sunburn and a rolling chair with height adjustment. It’s unbelievable how a good working space will add to creativity. The clean up also resulted in a treasure hunt of sorts. I found supplies I forgot I had…..exciting goodies! Even better, I discovered templates for projects I made so long ago I don’t remember their origin. I promise to share my tremendous finds with you once I turn them into projects. I already have a design for a great Christmas card and some one-sheet mini-journals. Okay, back to the newsletter…. I wish I could turn back the clock to photograph more of my children’s Halloween days. Maybe because it’s only one day in the year, we don’t seem to have many pictures of the boys in costumes. It would have been easier if there were digital cameras and computer photo files back then. As I looked at all the cute Halloween supplies in Ben Franklin Crafts, it occurred to me that I could still make a small album to collate all the past Halloweens. I liked the Making Memories 12x12 Halloween scrapbook papers with the glitter and shiny embossed designs, so I made a mini-matchbook album. The inner pages are plain black linen cardstock and I embellished the cover with a cut-out of a rubber stamped cat (Martha Stewart) that I flocked. (I stamped black ink on black cardstock then sprinkled on Stamp-n-Bond, used the heat gun, and dusted the image with black flock.) If you use black ink on black paper with black flock, no one will notice if there are a few bald spots on the cat. The ribbons (around the cat’s neck and on the bottom flap) were from the Martha Stewart craft line. I plan to use the Martha Stewart double adhesive Halloween stickers and glitter on the inside pages with my photos. Stampendous orange glitter is really ORANGE and they have orange flock too so I probably will use them. I think, if I journal with shiny purple or silver ink, the words will show up dramatically. If you don’t have a powerful stapler, you can use thin paper for pages instead of cardstock. This mini-matchbook album could also be a cute note pad party favor. Anyway, I hope that you will be inspired by my mini-album to collect your Halloween memories. I’ll try to write up a project page soon. Remember, take your pictures now while the kids are still cute, (I mean little). When most of my crafting for the day involves cleaning up and organizing, I feel I deserve a treat so I make myself a pair of earrings. Making earrings is quick and economical. You only need a few beads and a few minutes. Most of the time I use sterling findings (head pins, ear wires, chains, and 24 gauge wire). The three earrings in the photo are the latest treats to myself. The copper flower earrings are accented with turquoise. The pair with the silver circles is made with blue opal chunks and the abalone earrings have button pearls with blue pebble pearls dangling from chains. Because the earrings are so easy to make and just use a few supplies, it’s easy to make a pair to match any outfit. Somehow making and wearing a new pair of earrings is good for my mental health too. It’s hard to be sad when I have bling-bling swinging on both sides of my head. I’m STILL cleaning my craft area so I can move the big table and put up two shelves. I STILL have not finished the newsletter. I am STILL playing with my newest craft toys and supplies. Okay, I’m a baaaaa-a-a-d girl, but I have discovered a new tip to share. While trying out the Making Memories flocking and foiling holiday kit, I found that the EK Success adhesive eraser works very well to remove the adhesive rub-on if you make a mistake. 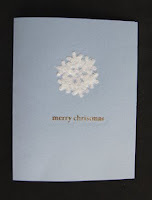 With the kit you can easily make a dozen or more simple but professional-looking cards. 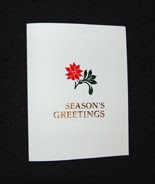 The holiday-themed adhesive rub-ons come with several sheets of flocking and foil. I had a little trouble with getting the adhesive where I wanted it and I thought the white flocking was a bit thin so the under color showed through. The red flocking looked marvelous. The foil should be rubbed on with your finger and not the Popsicle stick, which seems to rub off the foil. The best method seems to be to keep rubbing and moving the foil until full coverage is achieved. To solve the problem of the too thin white flocking I just added more flocking using a ballpoint glue pen and white Fun Flock. The effect was a fluffy snowflake, which I thought was perfect! As I always say, we learn the most from our mistakes.